With the dust of the holiday madness now settled, itï¿½s time to get ready for Americaï¿½s favorite televised football game and all the tasty, finger-licking food that comes with it. The Big Game ranks number two in U.S. food consumption behind Thanksgiving, so this is the time to show off your skills and feed your hungry pack. When preparing for any party, thereï¿½s rushing around, trips to and from the grocery store and your counter space is dominated by dips, chips, casseroles, and pizzas. Your conventional oven is probably occupied by another dish, leaving you with raw meat and little time to cook. 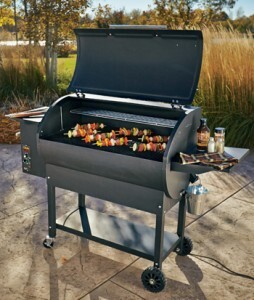 If you havenï¿½t considered using a pellet grill for food preparation, think of the convenience of an extra cooking surface, effortless use, and a mouth-watering smoky taste. Below is a recipe and a how-to on getting the most out of your pellet grill. Complete The Big Game buffet with a hearty helping of chicken wings and don’t forget to point out that they are high in protein too. Start by cutting the wings into thirds with kitchen shears. Mix whiskey, soy sauce, and brown sugar in a mixing bowl. Place chicken wings in the bowl, cover with foil, and marinate over night. Give yourself a little over an hour before the party starts for preparation. Set pellet grill temperature to 350ï¿½. The auger automatically feeds the pellets to keep up with the temperature you set it to. When ready, arrange the wings on the grate and cook for 30 minutes, then turn the wings over, cooking for another 30. The chicken wings should have an internal temperature of 165ï¿½ for doneness. Transfer wings to a bowl, drizzle liberally with honey, then toss for an even glaze. Spread the wings out on foil and brush with the chilled Frankï¿½s Red Hot Sauce to seal in the honey. Whomever youï¿½re cheering for (or just watching for the commercials), hopefully youï¿½re surrounded by a crowd that not only loves a good game of football (hereï¿½s wishing itï¿½s more exciting than last yearï¿½s) but also isnï¿½t afraid to get their hands on serious tailgate-worthy food.